The day of the drive back across Germany and Holland arrives, and after a final tidy up, the truck is packed with the remaining incubators and other kit and we’re off. Within an hour we’re back on the autobahn travelling west towards Braunschweig, and Hannover. Early afternoon we pass Osnabruck and arrive in Holland. With a few hours to kill we stop at the Kroller-Muller museum of modern art in De Hoge Veluwe national park, a big area of semi-forested heathland near Arnhem. It’s our last day at the mill and there’s a slight air of sadness. The showery weather doesn’t help but Damon and I are determined to make the most of it. We go searching for presents for home and head for Chorin. There is a serious lack of tourist shops in the area and we settle for some items at to Brodovin organic farm shop. We get excellent views of a pair of cranes feeding in a maize field by the side of a road in Chorin and they approach to within 30m of the truck. Eberhard is keen to take us to an area of old beech forest in one of the core areas. It’s a lovely spot to the east of the mill. We walk under 200 year old beech trees and look up in awe at the largest field maple either of us have ever seen. The ground flora is luxurious with the species we’ve seen elsewhere. Sadly there’s no sign of the red-breasted flycatchers which breed here, perhaps it’s still a bit early. Hans arrives early to continue his work on the pond terrapin reintroduction project. His consignment of terrapins Emys orbicularis has arrived and he gives me a grand tour of the facilities and shows me the terrapins. They are remarkably alert and eye me suspiciously. The dark green base colour of their skin is flecked with pale yellowy-green spots, although most of the patterning is obscured by copious pond weed. The little beady eye is pale with a dark iris, except for those animals sitting under the sunlamps in their tanks with their eyes closed. A quiet day today and another chance to spend the morning by the mill lake, enjoying the bird life and a few more insects including the first tortoiseshell butterfly. It’s still too early for many bird migrants although the next week should see peak arrival. I drive into Angermunde, on the way spotting a very neat summer plumaged black-necked grebe on a small feldsolle and a pair of marsh harriers. A black woodpecker flies up from a field just as I get into Altkunkendorf. Another early start for Toby and Nick to leave by 7am. They pack their gear around the static incubator, which, wrapped in bubblewrap and protective cardboard, takes up most of the space. They only just get everything in. We say goodbye as I look forward to a day to explore the local forest. 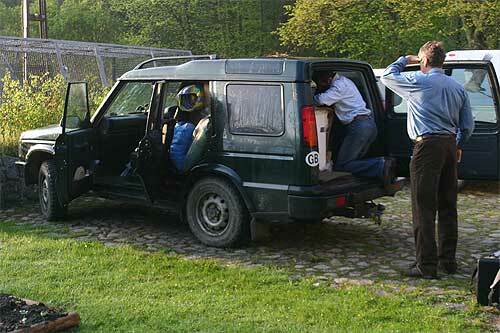 Nick and Toby pack the range rover but where will they fit in? I wake early, listening to newly-arrived great reed warblers on the mill lake. Outside, I locate three different males on the southern side of the lake. Despite their size and loudness, they are tricky to see. Eventually I pick off one bird hopping around in the reed leaf litter, churring. like a souped-up reed warbler. Nick and Toby are ready to do more filming and I join them to help with some ‘drive by’ shots of the truck which they haven’t yet got. We drive to a lovely spot just outside Altkunkendorf and do several takes. We have an early start to get Roland and Damon on the 9.30am ICE train from Berlin Hauptbahnhof train station to Hamburg, where they will catch a plane back to Heathrow and a hire car back to Slimbridge with the seven eggs from the second phase collection. Damon has talked a great deal with the PR people at the train company and the airline to ensure a smooth journey back England, especially since both he and Roland will be carrying batteries attached to the incubators on board the plane. We only need to collect two eggs at the most today but none of us feel complacent given yesterday’s experience. We have to get back to the mill for 2pm to meet the vet again, but the mood remains relaxed. Today is the start of the second phase of egg collecting and follows the pattern of the first collection. We have 1½ days to collect up to seven more eggs, and need a new permit from Mr Ventland the vet to take them out of Germany. Beate and her team will monitor sites where we have taken eggs to see how many crane pairs re-lay. Cranes normally lay two eggs.